You will have to remove the starter from the vehicle. 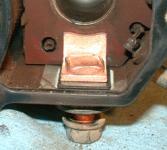 You can then see inside the solenoid to the starter solenoid contacts. 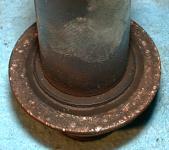 Its the wear on these combined with the burned surface on the plunger that is causing those clicks when you go to start the engine. 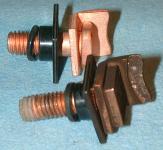 The starter solenoid contacts shown are both new (bright) and old (dark). If you look closely you will see on the old one there is an area worn away on the flat surface that contacts the plunger. Its this extra distance that the plunger need to travel that caused the intermittent connection and the clicks. Clean up the plunger as shown. You need to take off the starter solenoid contacts from the large bolts on the starter case and "tap off the old starter solenoid contacts" from the bolts. 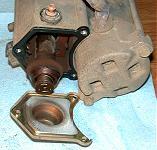 You install the new starter solenoid contacts the same way. 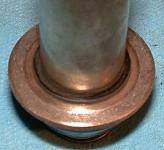 You will see that there are some insulators protecting bolts from the metal case. Its important not to forget to reinstall these the way they came off. 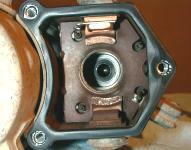 When finishing the insulation of the contacts make sure that they are sitting flat in the starter. 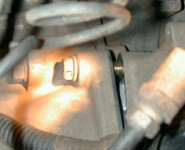 If they are not, (and in tightening the lock bolts they can twist) the starter will click again after a couple of days.